Starting today and with my newly completed painting of my grandson, Joey, I decided to challenge myself with the goal of creating a "Gallery of Faces." I hope to learn a lot from this challenge including the further development of my skills as a portrait artist. I confess I'm excited at the thought of it. I consider myself a "forever student" in the field of art and have always been intrigued by the face and how to paint it. 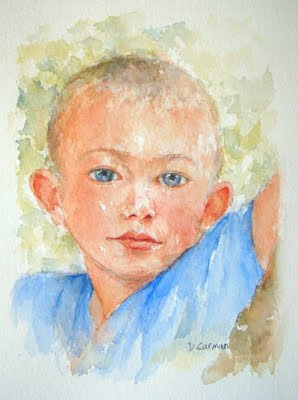 I especially love how the fresh look of watercolor captures those beautiful facial features. So here is my plan: I will paint a "face" each week and post a picture of it on this blog. I'll take a few months to complete the task. My medium will be watercolor. I will most likely paint on paper and will probably keep to the 5x7 size in most cases. And I'll leave the option open whether to use pen, watercolor pencil and/or ink in addition to watercolor. So there you have it. My Gallery of Faces is now official. Be sure to comment and/or critique. I would love to hear from you. P.S. If you have a "face" that you'd like to see in watercolor, click on "Commission a Watercolor Portrait," just to the right, for details on how to make that happen.